I have to admit this is not the most fun blog I have ever had to write, but I’m still trying to stay positive. I think it’s safe to say this wasn’t the way we wanted to close out the first half, but life goes on and so will this season. The good news is we are still in contention and we hold our fate in our own hands. There are several teams around baseball that can’t say that right now. We have an opportunity to play our division many times coming up early in the second half and it’s up to us to take it to these teams when it starts back up. On that note, kids always have a way to put you in a better mood because they are so innocent and just want to have fun. That’s why I am so excited my kids baseball camps started today. (For more info you can check out BullsSoxAcademy.com). I’m really looking forward to these camps and working with the Bulls/Sox Academy and I know it’s going to be a lot of fun. Hopefully this is the beginning of many more camps in the future! Other than the camps, I will spend most of the break relaxing and will definitely hit the golf course a couple of times. The most important thing for us is that our guys clear their heads and come back fresh. I will try and do the same. I know PK (Paul Konerko) and Carlos Quentin will represent the White Sox very well in the All-Star Game. And, of course, hopefully they will help the American League win because you never know, maybe it will help us down the road. I will keep you guys updated on the camps this week on my Facebook and Twitter! I hope everyone had a very happy and safe 4th of July weekend. Happy birthday to the U.S.A., and thank you very much to all the people who serve this country! Our weekend wasn’t too bad. We took two out of three from the Cubs and won another series. Last night, we won on a balk against the Royals — a “balk-off.” Sometimes it’s better to be lucky than good, and right now, I’ll take them anyway we can get them. The series vs. the Cubs ended on a bad note because we couldn’t score any runs off of Rodrigo Lopez — a guy I felt like we should handle — but this is baseball and sometimes crazy things happen. The All-Star teams were announced over the weekend, and I’m very happy for Carlos Quentin — he deserves it. I also think Paul Konerko was very deserving because he has been amazing for us the entire season. I know what it’s like to try and pick reserves for the All-Star team and know what Ron Washington is going through. That is not an easy job. We get the Royals and Twins this week, I think, and yesterday started a stretch of 19 straight games against our division. The Royals always seem to play us very well, and it’s time for us to start swinging the bats a little better to close the gap before the break. The next 3 weeks are either going to have us out of it or right in the thick of things for the home stretch. Hopefully we can make the right adjustments and continue to win ballgames. See you guys at The Cell! My last Q&A before Opening Day! A: I can only work with what I’ve got. Sometimes, the pieces they give me don’t fit the Caribbean style. But this year, I feel we have more better speed and there are going to be a lot of runners on base. change, although I hope I don’t change the lineup too much. could see him dress up and make everyone laugh (haha). A: They’re both good people. They treat me very well, and they’re both stars and I respect them a lot. A: Well, I’d like to help you but that’s not my area of expertise. Send your info to the White Sox offices and see what they say. Good luck. A: I think if Lastings stays within himself and doesn’t try and do too much, he can help us — not only in late innings, but starting as well. want season to start already. Q: Can Lastings Milledge be an everyday player for you guys? How did it go with Manny Ramirez last year? Take care. — Guillermo R.
A: I don’t think Lastings is going to be a regular because we already have three very good outfielders. Manny and I were fine. Really, he never gave me any problems, and I have a lot of respect for him. A: Omar Vizquel, Miguel Cabrera, and after that I don’t know who has a real chance. I hear Gaita in December. But only in December (haha). to Spring Training this year. We really appreciate your support. are coming this week, and I will be sure to post them! more good ones this week. … Enjoy. A: Yes, I am very happy with the rotation because if all our pitchers stay healthy, we have a chance to win a lot of games. Konerko, I imagine, is fine (hahaha). I never worry about him. A: Well, thanks for the well wishes. Look, to enter the Hall of Fame, you have to manage for many years and win as a manager. But at this moment, I don’t worry about that. I’d like to win more championships — that’s the only thing that matters in baseball. study the game within the game. They don’t just go out there and play. A: Thanks; the idea behind the website was to be more connected to the fans. Building the roster isn’t that difficult because the majority of the time, the ballplayers are in or out based on their play. For me, the thing I like least about my job is sending down players to the Minors because I at one point was one of those, and as an older player, too (haha). A: Good question, and I wish I had the answers. I don’t think that the reason Venezuela has lost in the last two WBC’s is Luis Sojo‘s fault. The reason has to be that the teams from Asia have a lot of time together and they’ve already been playing the entire year, while the other teams can’t play up to their full potential. I really think there could be a lot of managers who can keep order and that the players would want to play for. A: (hahahaha) I’m sure you do a better job than me. Hopefully we’re champions — you on Wii and me in real life. A: Well, I’m 47 years old. I don’t think I’m going to change now at this age. I say it in the sense of trying to be more calm because every time they throw me out of a game it costs me money (haha). Lots of money, and my family can benefit from that. bodies can rest and mature without straining the arm all year? –– Bob C.
A: Well, those players are and were the best, as well as role models to kids, and now I have the honor of serving as manager to one of them. To me, Omar is the one who dominated the position. David was my idol and the prettiest (haha). Luis is the only Hall of Famer and the one with the most girlfriends (hahaha). And me, I’m the one that has the most money (haha) — just joking. I’m honored to say that with all of them I’ve had relationships and friendships that I’ll never forget. Your questions, answered from Spring Training! getting in with less home runs, so I definitely think he has a chance. counts because of the endurance of the pitcher. Back in the day, I don’t know what those guys were made of (Iron and steel, maybe? I don’t know.) but it was very impressive. do all of this while eating some popcorn. Guerilla” in the 80’s, and my best friend was Gus Polidor. May he rest in peace. thought of bringing him back as part of the coaching staff? — Octavio G.
vocal, and I’m not sure JD wants to coach yet. How’s everyone liking the new Web site?? So, I went on and started to check all the questions you have been asking on the “Ask Ozzie!” portion of the site, and I couldn’t believe it… there were hundreds of questions already! Thank you all for your interest in the website and sending in your questions. I will try to read them all and will respond to as many as I can. Q: Hello, Ozzie. I was just wondering… how is Paul Konerko signing a new contract with the team a big plus for the upcoming year? I used to live in Chicago but moved to Texas, and I still am a BIIIIG FAN! Paulie is my fave. — Matthew M.
A: I think P.K. wanted to come back to Chicago, and obviously the front office wanted him back. They worked hard and made it happen, and I am very happy they did. It would have been very hard to replace someone like P.K. Q: I remember being a kid and watching baseball when you were playing, and it didn’t seem as if there were as many power pitchers as there is now. What do you think the difference is? — Thomas A. A: I think part of it is that players work harder these days, but maybe the bigger difference is nowadays scouts look for more power arms. Q: Hi, Ozzie. I admire your enthusiasm for the game. You are good for baseball. I’m a life-long Twins fan. Would you say you and Gardy [Ron Gardenhire] are friends, or just mutual combatants with mutual respect? Let’s have another great 2011 season! — Rich S.
A: I’m not friends with Gardy because we don’t hang out outside of the field, but I have a ton of respect for him as a manager and competitor. Not many people gave him the credit he deserves; he is one of the best in the game. Q: First off, I want to thank you for being a breath of fresh air in the city of Chicago. My question is do you think Mark Buehrle is headed for Cooperstown? And is this team gearing up to be better than the 2005 White Sox? Thanks. — Scott B. A: Thank you. I don’t know what type of ballclub we are going to have, all I know is we have talent. But comparing any team to the ’05 team is unfair because that team won the whole thing. As for Mark, he has easily been one of my favorite players I have ever managed, but I don’t think he has a chance at Cooperstown. I wish he could get in, but right now, I doubt it. Q: Formula One has their first Venezuelan driver this year, Pastor Rafael Maldonado. Do you follow this at all? Will you follow him? Thanks, Ozzie. — Larry C.
A: No, I don’t follow Formula One, but I am proud of him like all Venezuelans should be. I do follow Venezuelan golfer Jhonattan Vegas, though, because I do love gold and I’m very proud of him as well. Q: Why don’t you follow ANYBODY in your Twitter account? — Carlos S.
A: You know I’m not very good with computers, and I’m always getting new phones. I use Twitter to talk to fans, not follow people. Q: What part of Spring Training do you most look forward to? — Michael E.
A: First of all, I think Spring Training is too long. I always look forward to the games starting and seeing the new and old players get after it. Q: What do you think was the biggest reason the pitching staff got off to such a poor start last season, and how do you avoid that again this season? — Bob K.
A: I wish I had the answer to that one, but I really don’t. Most important thing to do is stay healthy and, unfortunately, I have no control over that. I pitch them and hope they stay healthy. It’s not about how you start, either; it’s about how you finish. Q: Hey, if the American League vanished and you could take over as manager of any National League team in 2011, which team would you pick and why? — Matthew K.
A: Hahaha… Wow. You’re trying to get me in trouble, huh? You know I can’t answer a question like that. 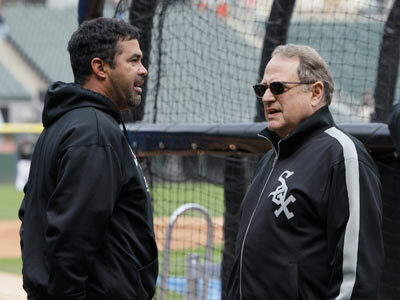 I’m the manager of the Chicago White Sox and very proud to be. Q: What is your one memory that stands out above everything in your managerial career? — Benjamin S.
A: Wow, that’s a hard question. (haha) Winning the ring, of course — that’s what this game is all about! WOW! What a crazy and awesome weekend! First of all, I want to thank everyone that wished me a Happy Birthday on my Facebook and Twitter pages. I spent some great time with my family, players and coaches, and it’s always awesome to see all the fans come out and support us during SoxFest. January is always a crazy time in my family, not only because of SoxFest, but this year, Chicago Sports Radio 670 The Score held my Celebrity Roast. The Roast was awesome and everyone was very funny, except for a few drunk people. (haha) Thank you to everyone for coming, you all looked very sharp and it was just an amazing day. Some of my pictures from the weekend will be up in the photos section of my new website, so check them out. Other than that, I got to finish up the weekend by relaxing and watching the Bears game. Chicago wants a winner, that’s it, so I was disappointed just like everyone else that they couldn’t pull it off. I hope you all are enjoying the new website. I think it looks great, and I’m very grateful for the work that MLBAM and Triple Crown did for putting in the effort to make this possible. I will be uploading fresh stuff all the time — pictures, videos, behind-the-scenes looks at what’s going on in my life — so make sure you are ready! Thanks again for all your support and always remember: If you want your dreams to come true, wake up and go get them! Hey, everyone! Sorry for not posting in a little bit, but I have been all over the place. But now it’s time to talk to you guys and let you know what I have been up to. Last week, I was at the Winter Meetings for a day. I am glad we made the moves that we made, even though I was probably just as surprised as you guys when I heard them. People in Chicago should feel very proud and lucky they have an owner like Jerry Reinsdorf, and also proud of the people in the front office for making such aggressive moves. I’m very happy we have my captain, PK (Paul Konerko), back, and I’m happy he will hopefully finish his career with the White Sox. As far as Adam Dunn goes — wow … he’s a big boy and seems like a very fun guy who stays loose and ready to play. I like that. Right now, I am in Venezuela and will be here for a few weeks. Other than doing some relaxing, I am doing some work through the Ozzie Guillen Foundation, helping out kids with cancer and other problems they face here in my home country. I will post some pictures soon on here as well as on my Facebook page so you guys can get a feel for what exactly we are doing. I was reading through some of your questions and one came up about “Ozzie Ball” and what it is exactly. I think most times, people don’t know what it means, so let me explain: “Ozzie Ball” means playing the game the right way; it has nothing to do with bunting, stealing bases or the lack of home runs. It’s about playing hard-nosed baseball the way I liked to play it, or better yet the way Paul Molitor, Lenny Dykstra, Rickey Henderson and George Brett played the game. I want 25 guys playing the game that way every single day. Q: Are you currently in your dream job? A: Yes, I am in my dream job. I have been with the White Sox for 22 years of my life, and I have lived in Chicago longer than anywhere else in my life. Chicago is my home. With that said, my home is where my family and I are at that current time, and right now, that’s Chicago. I hope it stays that way, but it’s out of my control. Q: Do you have a favorite place in Chicago to get a hot dog? A: I don’t really eat a lot of hot dogs, but when I do I like Maxwell Street by UIC. They have a lot of good food, especially the pork chops. Q: Ozzie, I’ve always wondered, what’s it like to make your money playing baseball? A: I was always blessed to stay healthy for a long time like I did to play the game that I love. It truly was a blessing. I hope everyone loves their job as much as I do, because when you do you really give it your best. Many of us who had the privilege to play baseball for a living recognize how blessed we are. That’s why I try to do as much for the community as I can. I want everyone to be as healthy and blessed as we have been. Q: Since the Dodgers have Juan Uribe and he played for the White Sox, what can you tell us about him? A: Uribe is awesome. He may look like a little Buddha, but he is an amazing baseball player. I think he is so good because he is not afraid of the moment. He really is fearless, maybe because he has no idea how big the moments actually are! (haha) I only kid with him because that’s my boy, and he will be great for the Dodgers. As I always say, keep the questions coming! Q: Ozzie, what do you think about Arizona? Do you have any favorite restaurants down there, and how do you like having Spring Training there? A: Arizona has great weather, even though it’s kind of weird because in the morning it’s freezing and then gets very, very warm during the day. I love the amazing golf courses they have out there, even though I need to get a lot better! Our Spring Training facilities are very good and convenient for the managers and players because they are all so close. It allows us to take batting practice in Glendale and then travel to our road games and back quickly. “Mastro’s” and “Mariscos Chihuahua” are my two favorite places to eat, and I go there often. In fact, I take the Arizona grounds-crew guys out to eat every year at one of those places. I love those guys. Q: Will you invite Kenny Powers to camp next spring? A: I would love to have Kenny Powers in camp. I also want that YouTube kid, Keenan Cahill — the little guy with the glasses. That guy is great! Q: Are A.J. Pierzynski and Paul Konerko staying? A: When you guys ask me questions about players, you guys are asking the wrong man. Q: As a former resident of Berwyn, Ill., do you ever get a chance to make it back? Any favorite restaurants? A: Yes, I have some good friends in the Berwyn Police — Jimmy Sassetti is my guy! My favorite place to go eat is :Mr. Tacos,” and I remember Orlando the Barber. Q: Is there still heat between you and Magglio Ordonez? A: No, me and Magglio did what we had to do. We moved on and respect one another. I’m happy when he does well. Q: What are your thoughts on global warming? A: To be honest, I really don’t know that much about global warming. I do know that we need to try and take a little better care of our environment, no matter what you believe. Thanks for all the questions, and remember to keep them coming! First off, I would like to thank everyone who took a few minutes of their time to send me their questions, opinions, congratulations and criticisms through this page. I am sure that this exchange between you and me will be very productive. In this second column I will respond to a couple of questions that were sent my way. I will also respond to a couple of comments that were made about the team, which, truthfully, is going through a tough time. I am still optimistic, as are my players, and I think that at any moment now we will combine good pitching, with timely hitting and solid defense, to get back on track. Up until now that hasn’t happened with the consistency we would like. Miguel Monges asks if it is possible to be able to finish in first place even though we have started the season with so many injuries. It’s true Miguel, that when we put a team together in Spring Training, the last thing we think of is losing so many key pieces due to injury. In 2004, my first year as manager, we lost our third and fourth spot hitters because of injuries in the middle of season and that ended any dreams we had of the postseason. It wasn’t impossible, but it was really hard to score runs without Magglio Ordonez and Frank Thomas in the lineup. That’s why I always say one of the most important things is to stay healthy, especially because of the 162-game schedule we play. Luis Angel Rodriguez asks that I keep a consistent lineup “as much as possible!” You are right Angel, that is the best scenario, but it’s not always possible because of injuries and the rest that some players that play almost every day need to get. When you have the goal of winning the World Series, you know that that effort will require an additional 11 wins in October, and it’s impossible to reach that goal without your key players in good condition and that means giving them a break from time to time. Additionally, losing your leadoff hitter because of injury during the first week of the season has forced us to experiment with different things in order to get each player in a spot where they will be productive. It hasn’t been easy, but I am confident that we will have a set lineup soon. Fernando Bosch, Rafael Castro and Sergio Villareal are just some of you that have asked about Jose Contreras. Honestly, I have to tip my cap to him for his professionalism. If before I respected him as a player because of his work ethic and enthusiasm, now I admire and respect him even more after the way he has handled the start of the season. Nobody thought that he would be ready before July or August, but he arrived in Arizona in great shape. Perhaps his rehab wasn’t complete and we rushed in getting him back in the starting rotation. It was his own idea to go down to the minors to work on his mechanics and that is admirable and worth my respect. Anyone else might have stayed at home enjoying his guaranteed money. Contreras went to Charlotte to work because he wants to come back and help his team. I am sure that will happen, too. Cristóbal Silva reminds me that we need a consistent leadoff hitter that doesn’t get hurt. It’s true Cristobal, and if you know where to find one, let me know and we’ll pick him up tomorrow! Juan Moreno asks how I am going to get the White Sox to play my style if we have a team of sluggers. This season we added some speed to the lineup with players like Dewayne Wise and Chris Getz to add to Alexei Ramirez and Carlos Quentin in order to let make us more aggressive on the base paths. Also, Josh Fields will add youth and power. Up until now, the injuries and low production hasn’t let us be more aggressive, but I am confident that we will be able to add the youth to the power and experience of players like Jermaine Dye, Paul Konerko and A.J. Pierzynski and score some runs. Smery Cortez and Carmelo Salazar have asked if Freddy Garcia is in our plans. A healthy Freddy Garcia, without a doubt, can help us a lot; I know better than most of his talent and what his is capable of doing in big games. Unfortunately, Freddy hasn’t been able to get the effectiveness back in his pitches because of injuries to his shoulder. I know that he is working hard and, personally, I hope he can soon get back to form because we are also great friends. The ultimate decision of his signing, though, would be the responsibility of our GM, Kenny Williams. I’d also like to respond to Martin Quintero, who says ‘he has heard’ that my son was signed by the White Sox without being a good player, because I forced the team to do it, and that because of that we didn’t sign better players. Martin, if you believe everything you hear you will end up going crazy. First off, I can say, that despite my excellent relationship with Jerry Reinsdorf, I don’t have the power to impose my wishes on this organization. My job has nothing to do with signing players. Oney Robert, the son you are referring to, was signed in the 36th round of the 2007 draft because there were people in this organization that thought he had enough talent to be a professional baseball player, and I assure you that he didn’t take anyone else’s spot. As a father, I supported him just like any father would. It wasn’t going to be me that squashed his aspirations of being a Major League Baseball player, especially for a person who has been surrounded his whole life by baseball and the Majors. He was born in January of 1986, a few weeks after I was awarded the 1985 American League Rookie of the Year Award. He decided this year to let go of his dreams of being a Major Leaguer, but his talents now are being put to work in an office job. I think his two years as a professional baseball player was a good experience and that it will help him grow as a person. I would love to have unlimited time and space to keep answering questions, but there are way too many of them. A couple questions that don’t have anything directly to do with me will be addressed by someone in the White Sox organization. Paul LaReau asks if there are White Sox signs and photos available for him to decorate his high school classroom in Indiana, Mavel Zubia wants to know about White Sox training clinics, Francisco Eduardo Arvayo inquired about if we are planning on playing in Hermosillo, Mexico again. Several of you also sent congratulations and good wishes which I have taken to heart. Keep writing, because I do my best to respond to all the questions. And again, thanks for your support.